Albi ( Occitan: ) is a commune in southern France. It is the prefecture of the Tarn department. It is located on the River Tarn, c. 85 km northeast of Toulouse. Its inhabitants are called Albigensians (French: , Occitan: ). It was the seat of the Archbishop of Albi and is the seat of the Diocese of Albi. The episcopal city, situated in the center of the actual city, around the cathedral, was added to the UNESCO list of World Heritage Sites in 2010. The first human settlement in Albi was in the Bronze Age (3000-600 BC). After the Roman conquest of Gaul in 51 BC, the town became Civitas Albigensium, the territory of the Albigeois, Albiga. Archaeological digs have not revealed any traces of Roman buildings, which seems to indicate that Albi was a modest Roman settlement. In 1208, the Pope and the French king joined forces to combat the Cathars, who had developed their own version of Christianity (a heresy considered dangerous by the dominant Catholic Church). Repression was severe, and many Cathars were burnt at the stake throughout the region. The area, until then virtually independent, was reduced to such a condition that it was subsequently annexed by the French Crown. After the upheaval of the Albigensian Crusade against the Cathars, the bishop Bernard de Castanet, in the late 13th century, completed work on the Palais de la Berbie, a Bishops Palace with the look of a fortress. He ordered the building of the cathedral of Sainte-Cecile starting in 1282. The town enjoyed a period of commercial prosperity largely due to the cultivation of Isatis Tinctoria, commonly known as woad. The fine houses built during the Renaissance bear witness to the vast fortunes amassed by the pastel merchants. Albi had a small Jewish community during medieval times, until it was annihilated in the 1320s shepherds Crusade. Ever since, Jews were only allowed to transit the town by payment, without living in it. In 1967, approximately 70 Jews lived in Albi, most of them of North-African origin. Among the buildings of the town is the Sainte Cecile cathedral, a masterpiece of the Southern Gothic style, built between the 13th and 15th centuries. It is characterised by a strong contrast between its austere, defensive exterior and its sumptuous interior decoration. Built as a statement of the Christian faith after the upheavals of the Cathar heresy, this gigantic brick structure was embellished over the centuries: the Dominique de Florence Doorway, the 78 m high bell tower, the Baldaquin over the entrance (1515–1540). The rood screen is a filigree work in stone in the Flamboyant Gothic style. It is decorated with a magnificent group of polychrome statuary carved by artists from the Burgundian workshops of Cluny and comprising over 200 statues, which have retained their original colours. Older than the Palais des Papes in Avignon, the Palais de la Berbie, formerly the Bishops Palace of Albi, now the Toulouse-Lautrec Museum, is one of the oldest and best-preserved castles in France. This imposing fortress was completed at the end of the 13th century. Its name comes from the Occitan word Bisbia, meaning Bishops Palace. 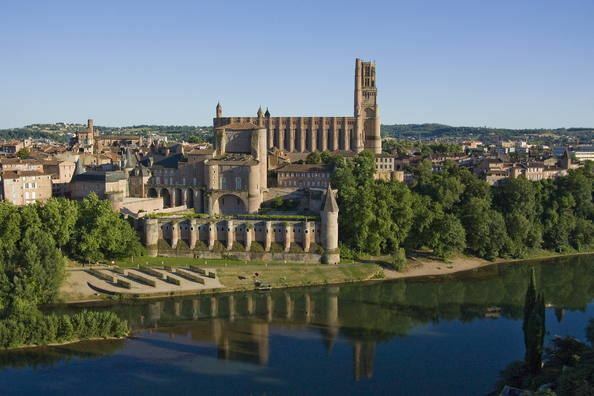 Albi is a city known for its elite Lycee Laperouse, a high school with 500 students situated inside an old monastery. It has several advanced literature classes. Furthermore, it is one of the few holding a full-scale music section with special high-tech rooms for this section. Albi is the home of the Toulouse-Lautrec Museum. More than 1000 works, including the 31 famous posters, are held here. This body of work forms the largest public collection in the world devoted to Toulouse-Lautrec. The Pacific explorer Jean-Francois de Galaup, comte de Laperouse was born in Albi and his discoveries are commemorated in a museum there.